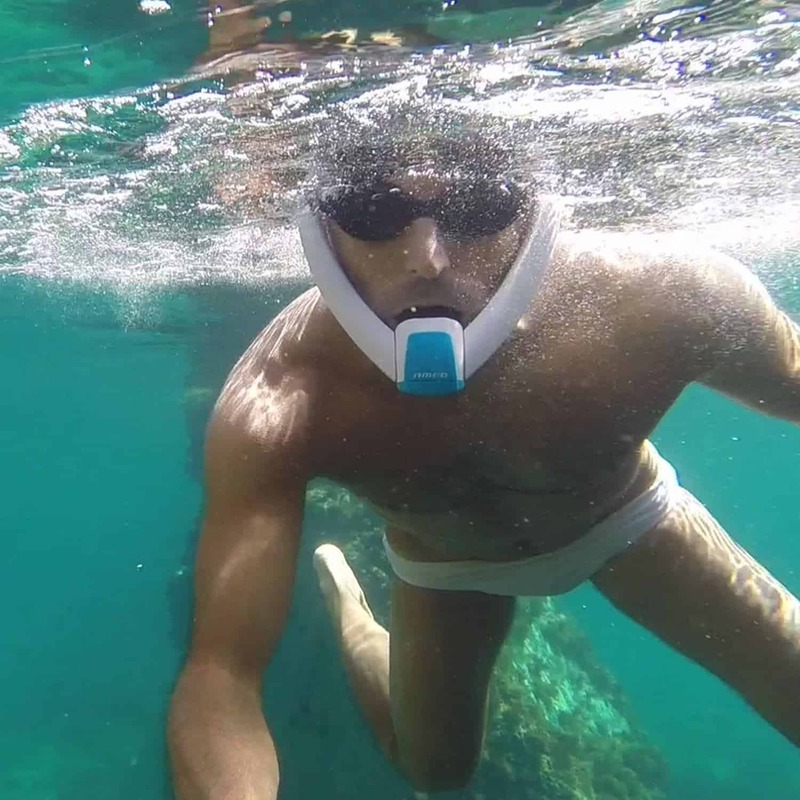 / PowerBreather Snorkel – Laps & snorkeling will never be the same! If you're looking for a swimming snorkel for the pool, the AMEO PowerBreather snorkel lets you swim or snorkel long distances without having to turn your head to breathe. It's great for recreational swimmers, triathletes, para-athletes, and recreational snorkeling. 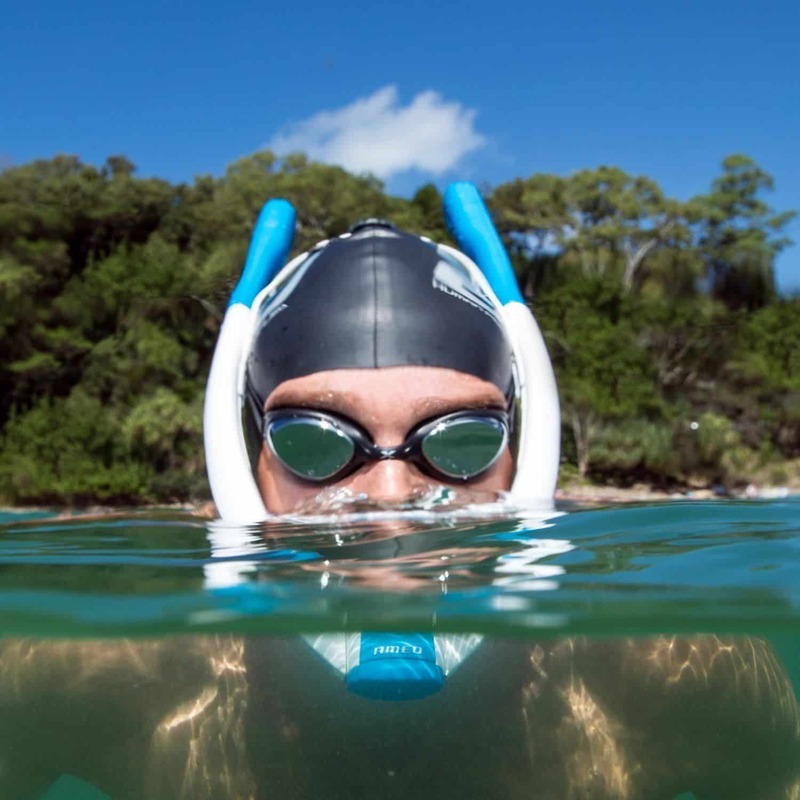 The PowerBreather Snorkel range has been developed to encourage both swimmers and snorkelers to stretch their limits, discover new horizons, and exceed their own expectations in the pool, lakes or oceans. The snorkel comes in 5 models to cover different swimming environments and can be worn with either swimming goggles or a face mask. Click on the item below to take you to the answer of your most pressing question, or keep scrolling to read the entire review. Who is this snorkel best for? Are there different sizes for men, women & children? How does the Fresh Air System work? Do this before using the PowerBreather for the first time! PowerBreather has the potential to help athletes of all levels. Its primary objective is to give swimmers, triathletes and snorkelers a great new experience in the water. This can be used by men, women, teens and children above the age of around 12 years old. With its dual snorkel design, ergonomics and hydro-dynamics, this snorkel makes long-distance swimming and snorkeling more enjoyable. This is thanks to the innovative valve technology within the snorkel. Swimming schools are using the PowerBreather to help improve efficiency, hydro-dynamics and technique of their students. Using this snorkel lets students focus on perfecting their arm and footwork without worrying about turning their head left and right to breathe. The only swimming stroke that this snorkel can't be used for is Backstroke. The video below shows how to adjust and become comfortable with this snorkel. Currently, the PowerBreather is only available in the one Adult size. This one size will fit a large range of people. The Ameo Twist Lock System, allows the snorkel to be adjusted to fit snugly on a range of adult sized heads, as well as small sized women and young teens from approximately 12 years old. This is not designed for use by children younger than an AVERAGE sized 12 year old. 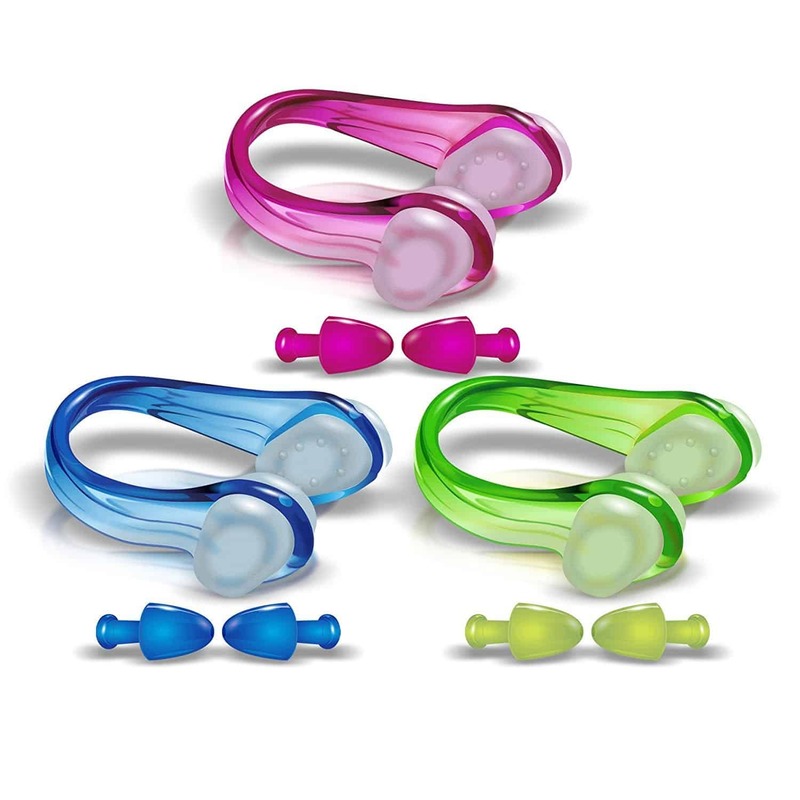 Children and small women can also attach an individual (smaller) mouthpiece to the PowerBreather. Have a look at the video above to see how easy it is to adjust the snorkel to different sizes. 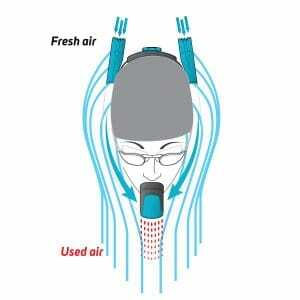 If you've got an extremely round head shape, the PowerBreather may pinch the sides of your face. If you're concerned, measure the width of your face. If it measures wider than 6.89 inches (or 17.5 cm), then this snorkel is NOT for you. It's not recommended that the D-Tubes be pulled apart beyond this width, as it will damage the snorkel at the Easy-Fit Air Junction point. The patented Ameo Fresh Air System is what sets the PowerBreather apart. 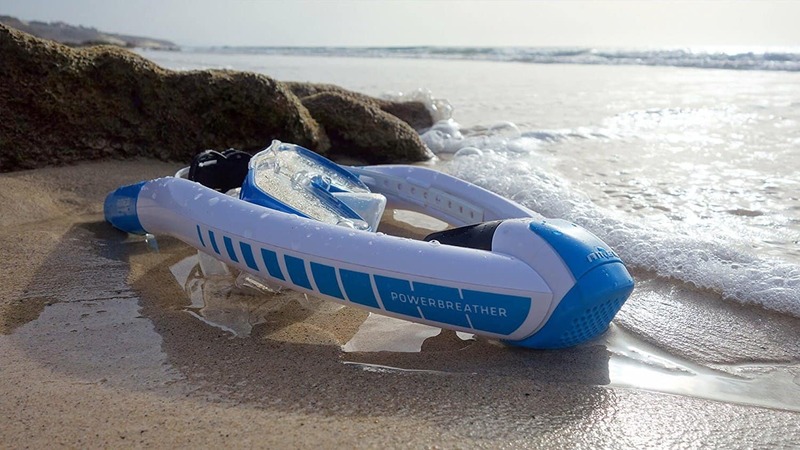 The PowerBreather is a symmetrical snorkel that has an innovative 2-way smart-valve system. The two air pipes run parallel to the head, and the smart-valve system separates exhalation and inhalation. Fresh air is drawn in from the top tubes and exhaled through the mouth vent completely separating O2 and CO2. This design prevents pendulum breathing, and avoids undesirable CO2 accumulation or performance drop. The snorkel is designed to prevent water and saliva from being inhaled, which happens with traditional snorkels. 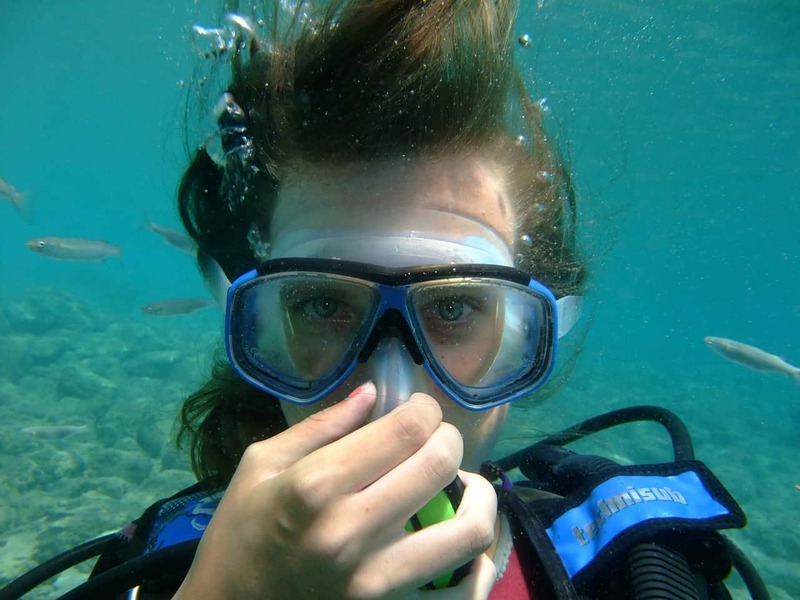 Also with traditional snorkels, you inhale and exhale through the same tube. This can be detrimental to your workout and health. The system uses a membrane system to stop water from getting into the tubes when swimming in rough water or through waves. There is no need to turn your head to breathe. A valve located in the top of each tube opens briefly when inhaling, and then closes to keep water out. 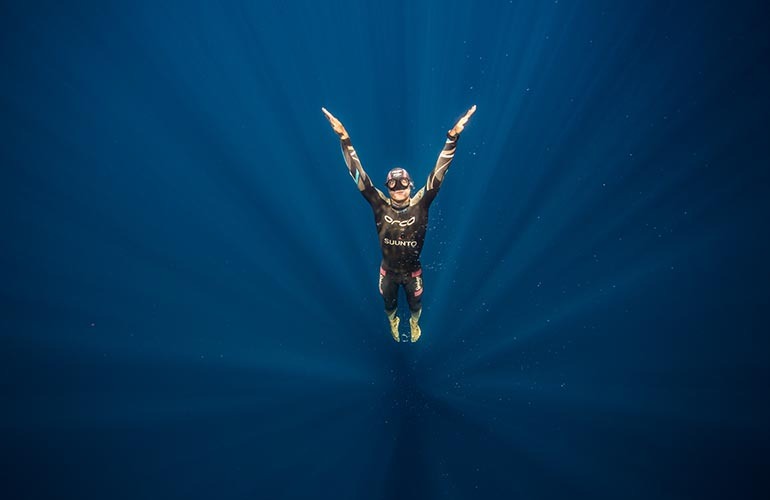 When diving underwater, take a breath and hold it - if you inhale while underwater, air will enter the speed vents. After resurfacing, there's no need to blow out water before taking in a fresh breath - just start breathing normally again. Generally, no water will enter the tube, but if it does (for example, during a flip turn, or if inhaling when a wave hits), this drained through the purge valve during exhalation. The short video below shows how the circulation of air works. Short speed vents are used for general swimming. The Short speed vents come standard on the Sports, Lap and Wave snorkels. The Long speed vents are 1.18' inches (or 3 cm) longer than the Short ones. These are also for swimming in wave-like conditions. The longer tubes will help anyone who naturally swims very low in the water and needs that extra bit of clearance. The Long speed vents can also help anyone who may need a little boost getting air sooner when coming up from a flip turn. Long speed vents are standard on the Wave, Beach and Adventurer models. Both the Long and Short speed vents (tubes) are interchangeable on all PowerBreather snorkel models and can be purchased individually as an accessory later on if required. In contrast to traditional snorkels, swimmers using the PowerBreather can integrate additional respiratory muscle training in the water to increase their respiratory volume through different membrane resistances, mimicking hypoxic breathing. What about hair buns, or do I need to wear a swimming / bathing cap? Swimming caps are ideal to use with the PowerBreather but not necessary. Wearing a bathing cap really helps the PowerBreather Snorkel to fit snugly on the head, particularly during flip turns. If you have long hair and like to wear it in a bun during swimming, then make sure the bun is placed as far back on the head as possible. This will allow the AMEO Twist Lock System plenty of room to be secured above the bun. How do I properly maintain this snorkel after swimming? Regardless of whether you're swimming in a chlorinated pool or in salt water, always thoroughly rinse the PowerBreather snorkel inside and out, after each use in fresh, clean water. Remove and rinse the valve caps (speed vents) at the upper end of each D-Tube, checking for sand particles. Dry everything and stow in its carry case. You'll find details in the User Manual. Are there any swimming goggles or snorkel masks to avoid using with this snorkel? 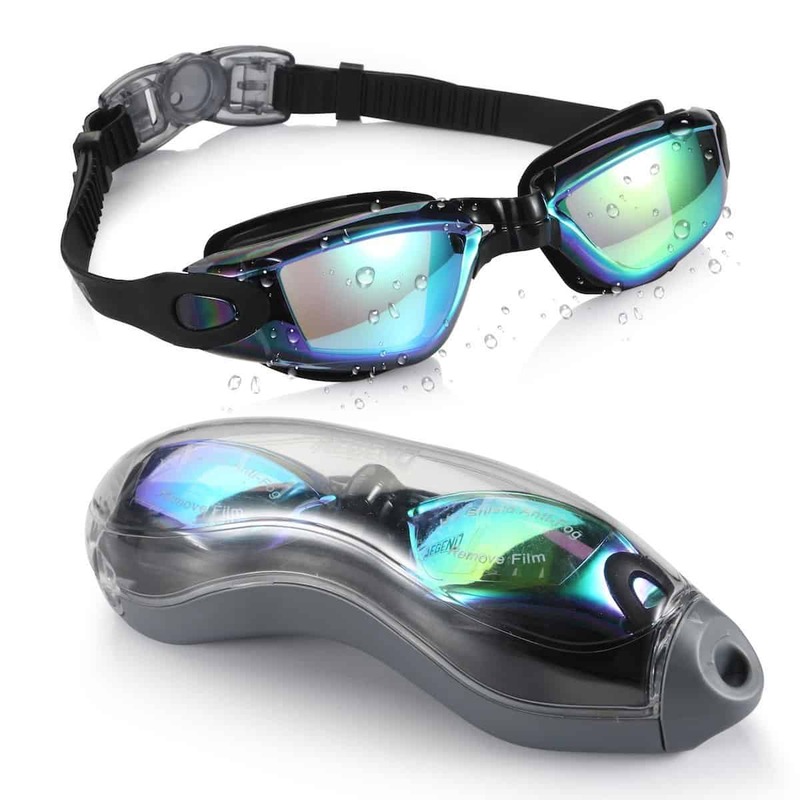 The PowerBreather can be worn with most swimming goggles or snorkel / dive masks. You must ensure the width of the diving goggles is not wider than 6.7 inches (or 17 cm) as this can cause the Easy Fit Air Junction to become damaged. Which swimming strokes are suitable to use with the PowerBreather? You can use the front crawl, butterfly, breast stroke and freestyle using the PowerBreather. The only stroke you cannot use with this snorkel is backstroke. Can I use swimming fins at the same time? You can wear the PowerBreather with swimming fins / flippers. The Twist Lock System used to secure the PowerBreather to your head, (with possibly a swimming cap), means the PowerBreather will not shift inadvertently even when swimming at higher speeds. Is the PowerBreather snorkel suitable for long distances? 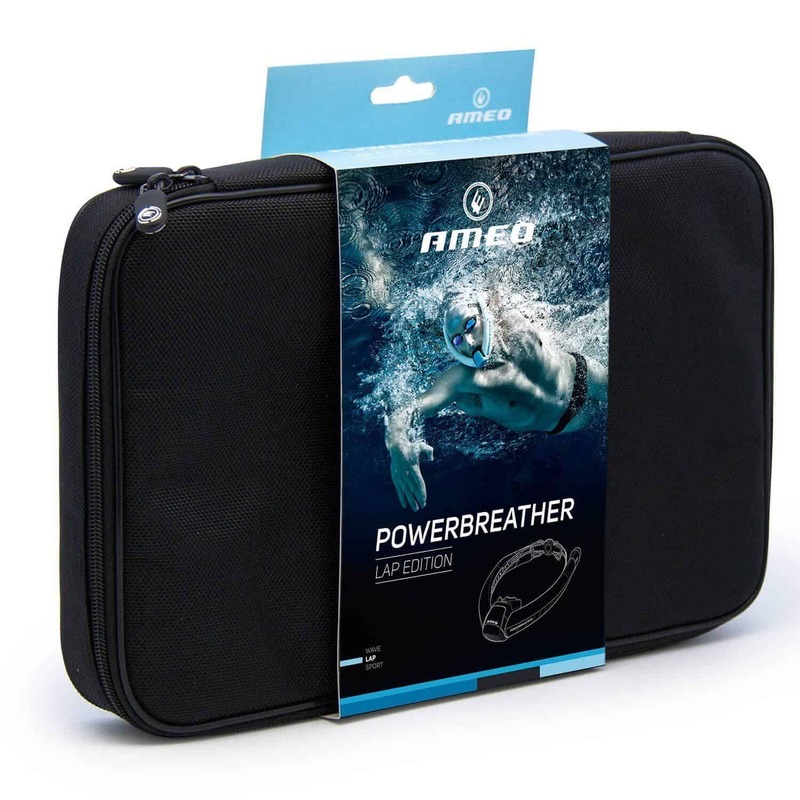 Theoretically, thanks to the valve technology of the AMEO Fresh Air System, ambitious swimmers as well as recreational athletes can wear the PowerBreather for an unlimited period of time – particularly for crawl swimming. Swimmers using the PowerBreather always breathe fresh air. There is no risk of pendulum breathing, i.e. increased inhalation of performance-reducing carbon dioxide. Can I do Starting Dives with this snorkel? 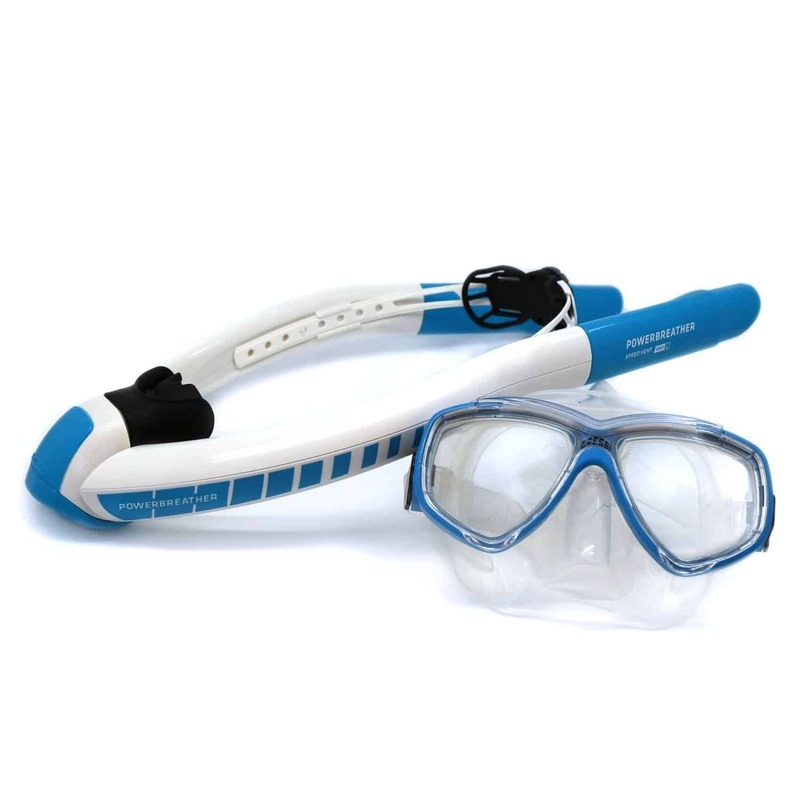 The manufacturer strongly advises against a starting dive when wearing the PowerBreather snorkel. The Easy Fit Air Junction is rather difficult to turn - Is this normal? The Easy Fit Air Junction has been designed so that it can't be turned too easily in order to help it remain in a stable position during swimming. This may be especially noticeable in cold temperatures and when it's new. If needed, you can turn the Easy Fit Air Junction several times under warm water before using it. How do I stop water entering the tubes during a Flip Turn? Exhale the majority of inhaled air only in a face-down position through the mouth, and not already in lateral position. Helpful Tip: The flip turn is even easier with the optional Flip Caps. If turning left or right, the BLIND CAP can be clipped on either side. The Flip Caps come included with the PowerBreather Lap Snorkel and Wave Snorkel models. 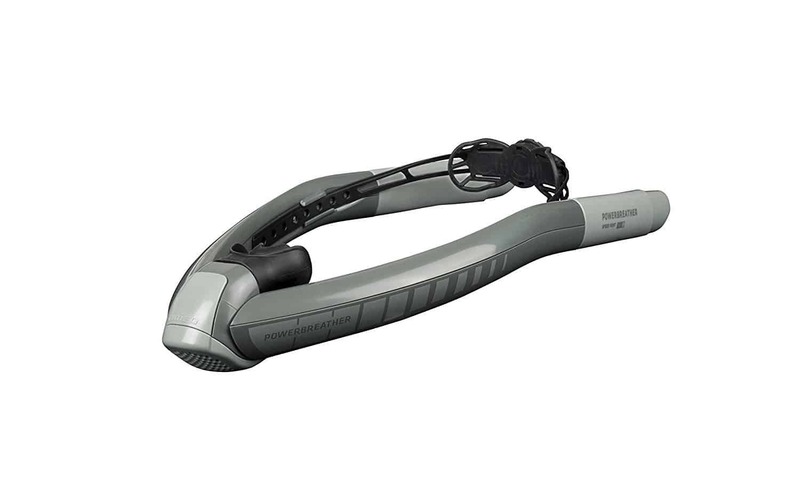 You'll find more details regarding how to do a Flip Turn with the PowerBreather in the User Manuals of these models. The video below also shows step by step how to do Flip Turns using this snorkel. Although the PowerBreather is intuitive to use, swimmers need to become comfortable with using it before swimming. It's a different breathing system, so allow some time to get used to it. These snorkels have membranes in the valve system to keep water out. 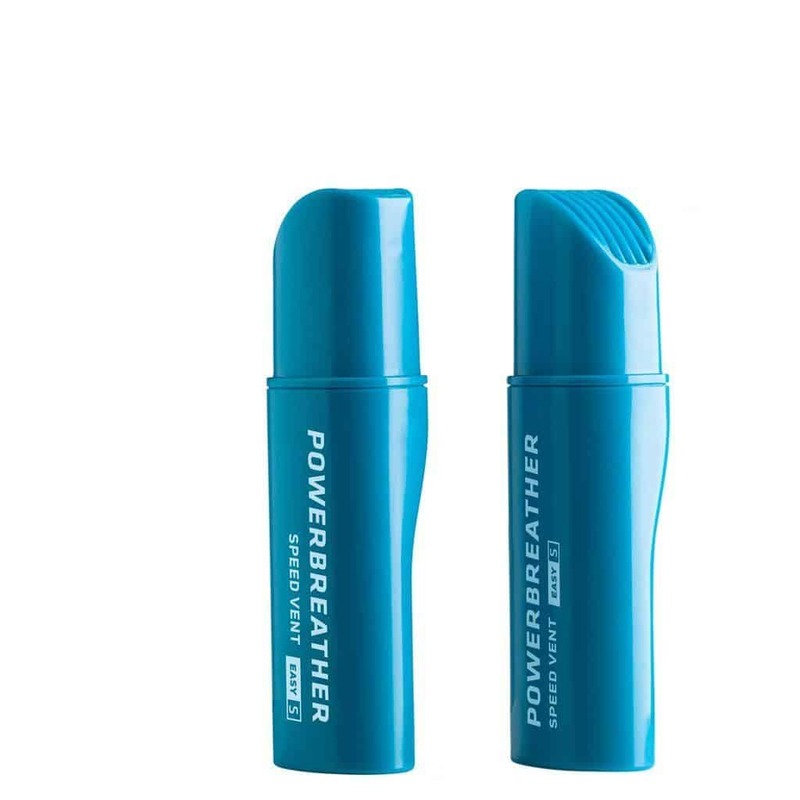 When you first start to breathe with the PowerBreather, you'll feel some slight resistance due to these membranes. After some initial use, this resistance will lessen. 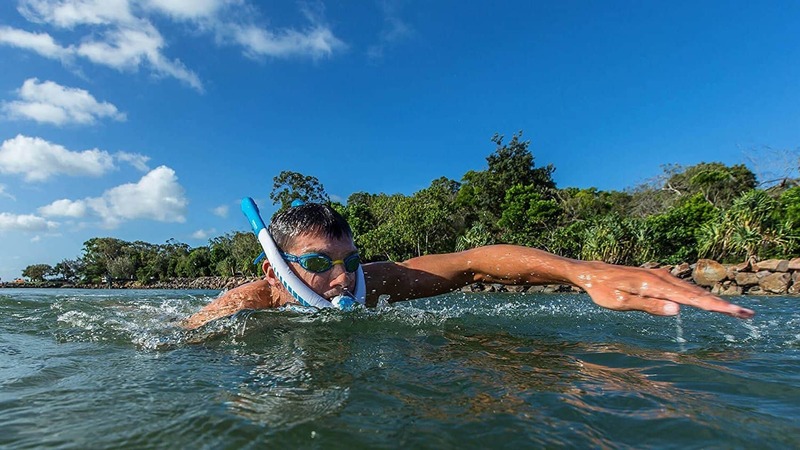 To become comfortable with using the PowerBreather snorkel for the first time, stand in shoulder-deep water and slowly lower yourself until both your nose and mouth are submerged. The ends of the tubes should remain above the water. Start to breathe as you enter the water, and you may feel the slight resistance. Once you feel totally comfortable with inhaling and exhaling, you can start your first PowerBreather swimming experience. Don't forget, this initial resistance will disappear after the first few swims. Note: This snorkel is designed for experienced swimmers and snorkelers. It should only be used by beginners under the supervision of someone who is familiar with its use. After receiving customer feedback on their earlier tubes, PowerBreather redesigned their air vents, making these easier to breath through. The new designs were released as standard in March 2017 and are labeled 'Speed Vent Easy S'. Previous models would have come with an equivalent to a Speed Vent Medium (a little harder to breathe through). If your speed vents do not say 'Easy' on them, contact Powerbreather USA for a replacement. PowerBreather USA offer great customer care and can be contacted here. The previous version of speed vents sold prior to March 2017 are now known as 'Medium' power vents. These are now available as an accessory for anyone wishing to develop their breathing capacity with a more resistant breathing tube than the Easy vents. The Speed Vent Easy tubes are also available at a reduced price for anyone who purchased a PowerBreather previous to the new release. 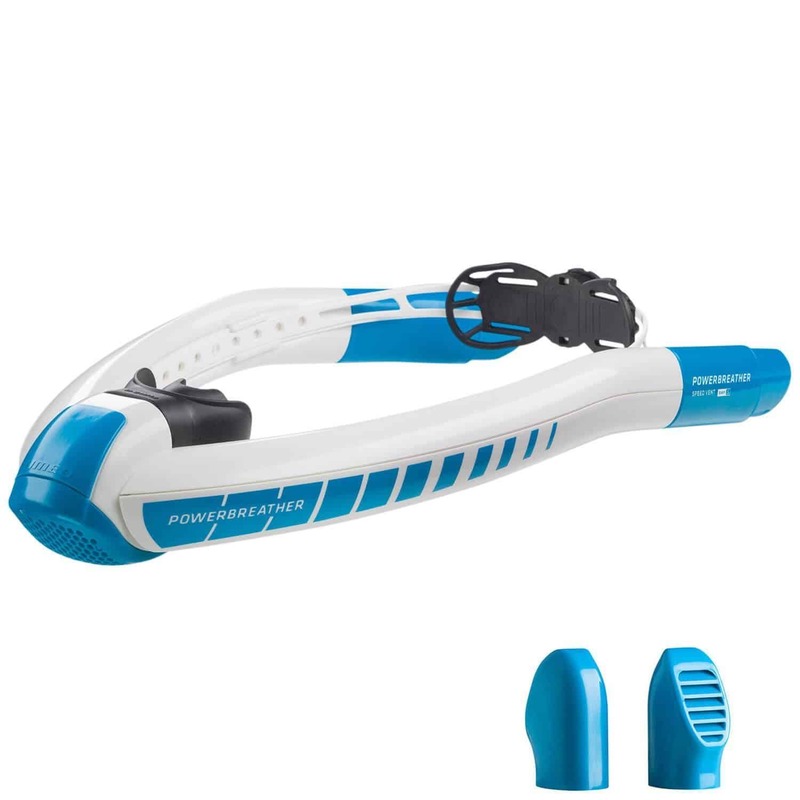 The Ameo PowerBreather Sports snorkel model is ideal for anyone swimming in a pool or lake. It's not designed for swimmers doing flip turns or for swimming in choppy waters. Good for lake or pool swimming for freestyle, breast stroke, butterfly and side stroke. Not designed for swimming in choppy waves or for anyone who sinks low in their strokes. It doesn't include the long (extended) speed vents. 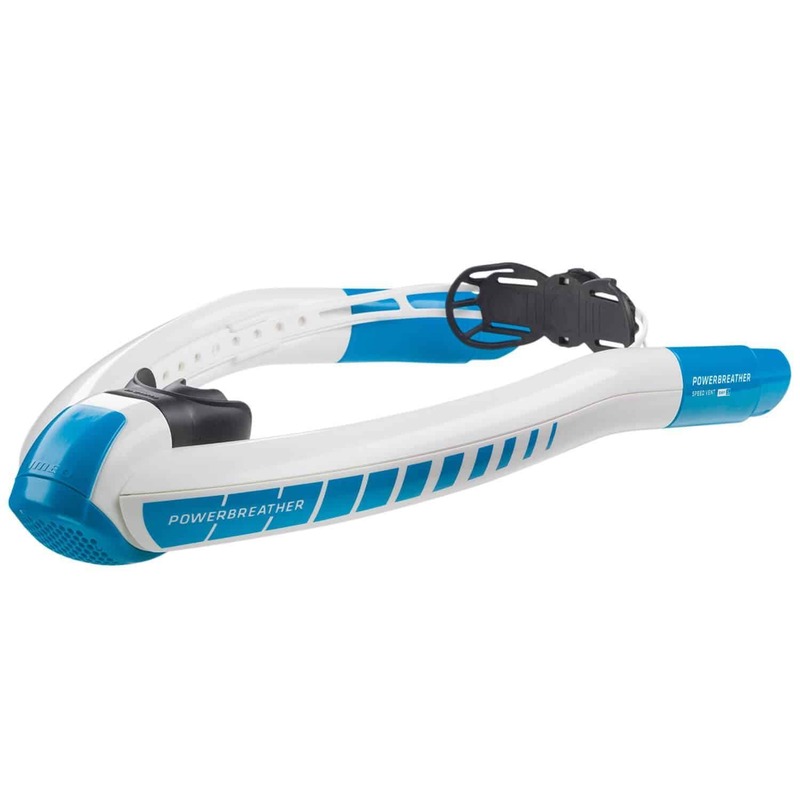 If you want to do flip turns then have a look at the PowerBreather Lap Snorkel (which comes with Flip Caps). If you're swimming in choppy water then look at the PowerBreather Beach Set which come with longer breathing tubes, or the PowerBreather Wave model which comes with flip caps and short and long breathing tubes. 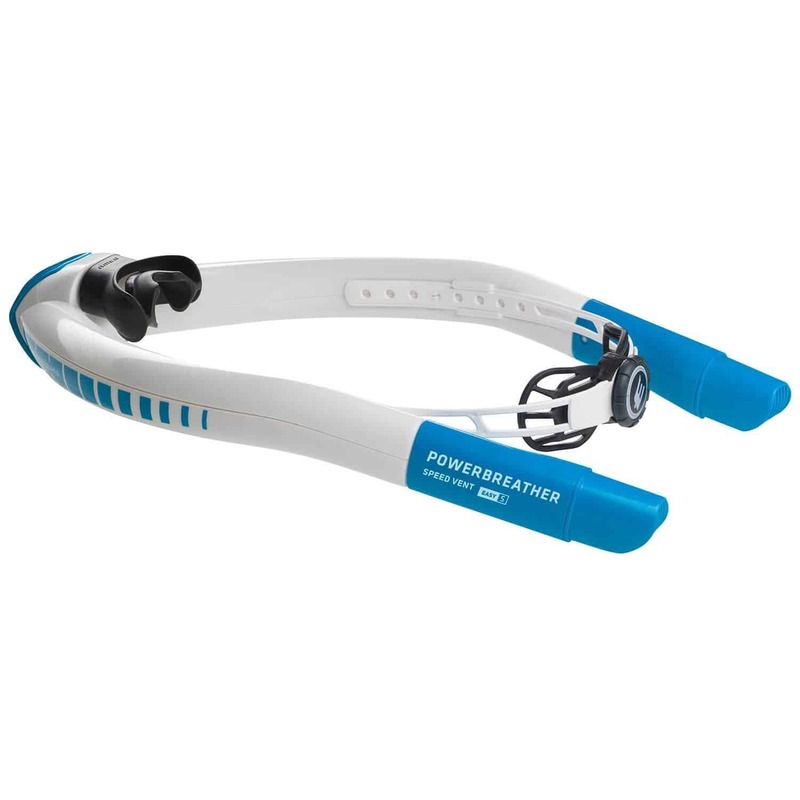 The PowerBreather Lap Snorkel comes with Flip Caps making it great for swimming laps and flip turns. It doesn't include the long (extended) speed vents, and isn't designed for swimming in rough open water or for swimmers who sink low in their strokes. Open water swimming in relatively calm water. The PowerBreather Lap snorkel comes with the Short Easy Speed Vents. It doesn't come with the Long Speed Vents. 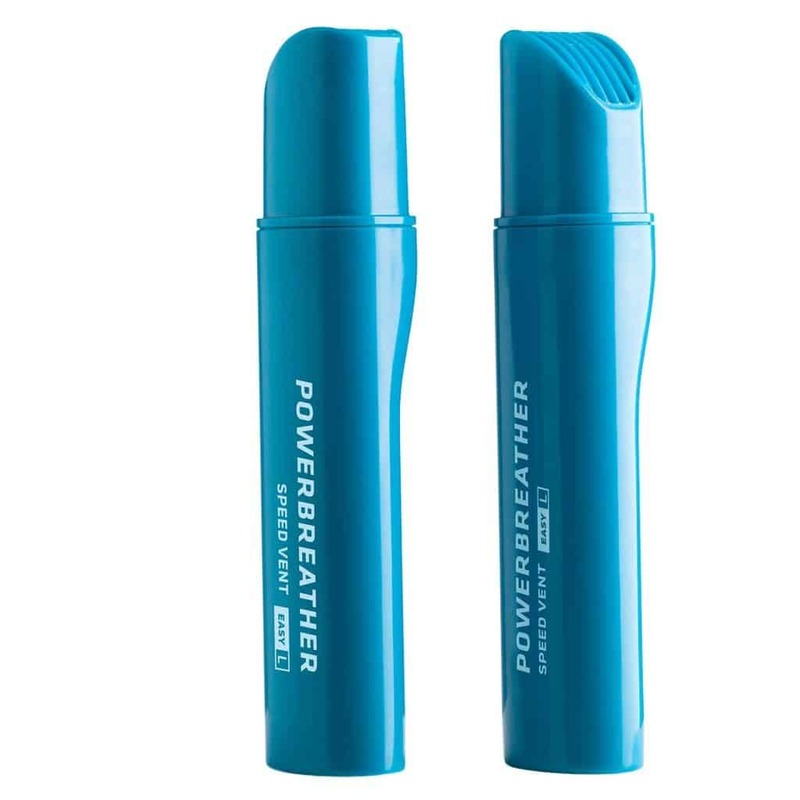 If you intend to swim in choppy water then take a look at the PowerBreather Wave model as it comes with both short and long breather tubes, as well as flip caps. 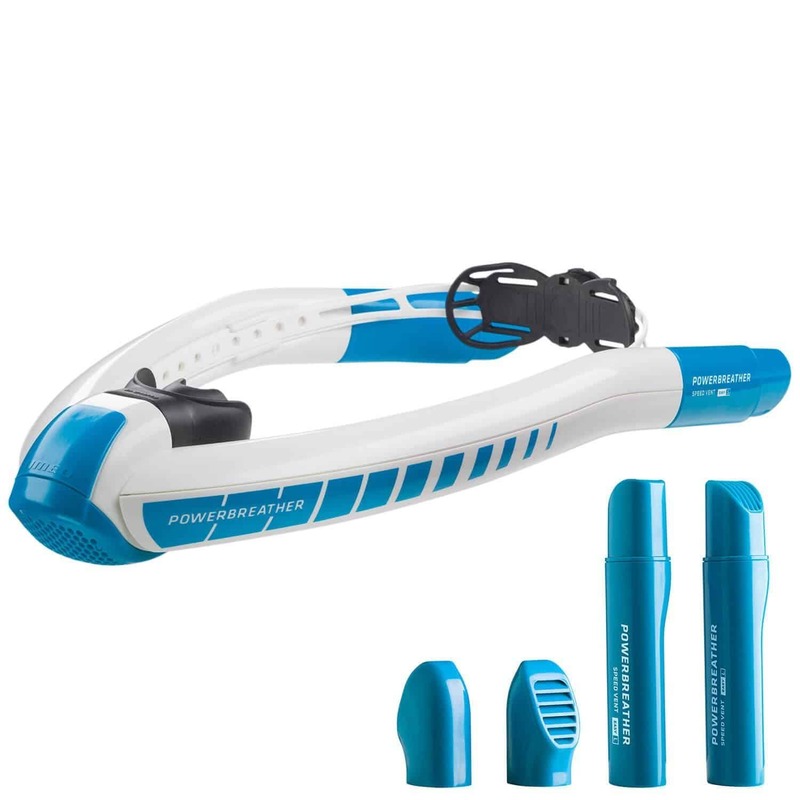 This snorkel is great for flip turns and swimming laps.The PowerBreather Wave Snorkel comes with Flip Caps, and both Short and Long Easy Speed Vents. The Power Beach Snorkel set comes with 2 Long Easy Speed Vents as standard, and a Cressi Perla face mask. The long Speed Vents make this snorkel ideal for swimming in choppy open waters. Cressi are a well known for making quality scuba and snorkeling equipment. The Cressi Perla diving mask is suitable for free diving, snorkeling, swimming and scuba. It has 2 separates lens made of tempered glass which is pre-treated with an anti-fog solution. The mask is made with quality silicone to ensure comfort and a good seal. 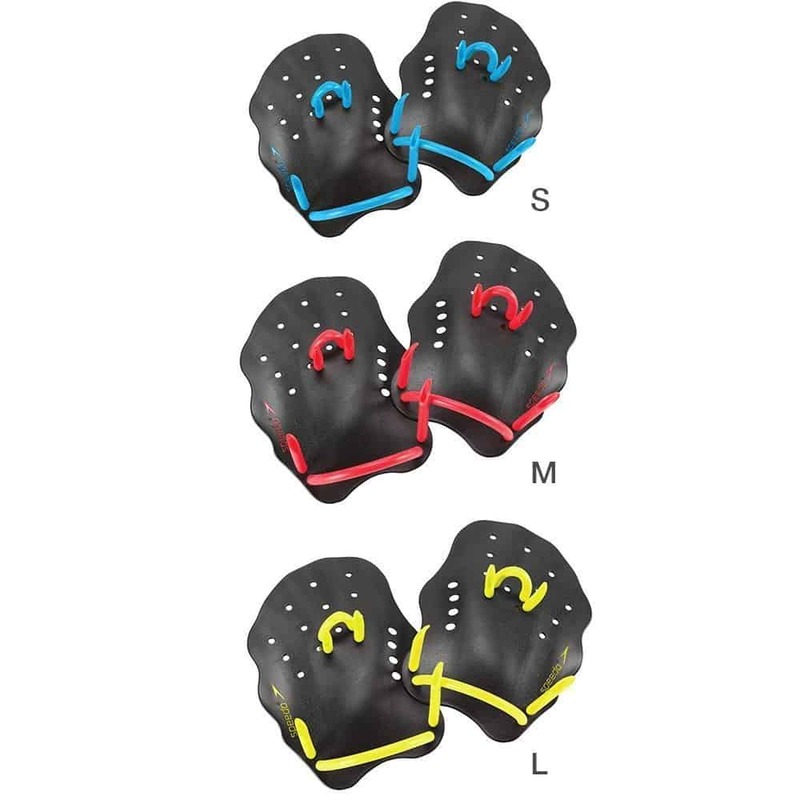 This mask comes with rapid Action Buckles to easily adjust the length of the strap. Not good for flip turns, or hypoxic training.